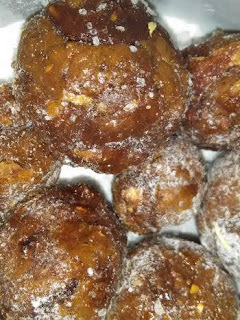 Time to take a trip down the memory lane...time to travel to childhood days again with this tangy, sweet & addictive imli bombs!!! Taste awesome, though turned a little hard! 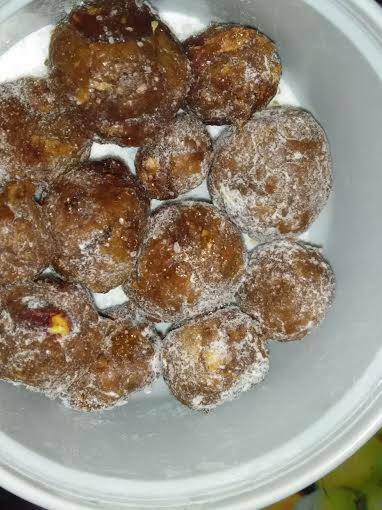 Nevertheless I am in love with these imli ladoos again! These were my favorite munching sweet 'n savory treats as a child. What about you? I am sure kids love them as much as we love these even today. So if you buy them for yourself or kids, why not try these delicacies at home? After all, home stuff is still better than the market junk? What do you think? De-seed imli and then grind it. The purpose is to make it soft so that it easily gets dissolved in jaggery. Take a thick, heavy bottomed pan and add jaggery. Heat on a low flame. 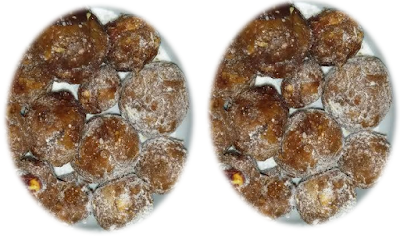 When jaggery melts, immediately add ghee, jeera, black salt and turn off heat. Now it's time to add ground imli. Give it a good mix. Keep aside for 10-15 minutes to cool down. Roll balls with clean hands when it is still warm & toss it in powdered sugar. Another method to prepare simple sweet & tangy imli gola or imli laddu is to grind equal quantity of imli and jaggery along with salt. Then make small balls and roll the same into powdered sugar. You will get tangy sweets that you'll love. Additionally, this method does not require ghee or heating.